WallaceAndGromit.net » Blog Archive » WnG Comic to be released September 29th! WnG Comic to be released September 29th! On September 29th (my birthday!) the leading publisher of graphic novels in the UK, Titan Books, will be releasing the first Wallace and Gromit comic! Following the success of Chicken Run, the OscarÂ¨-winning Aardman Studios now present their first feature-length Wallace & Gromit Movie, Curse of the Were-rabbit (out 14 October!)! 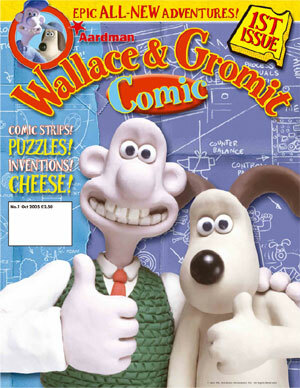 And to coincide with this massive launch, we are delighted to announce the launch of the Wallace & Gromit Comic! Every four weeks, Wallace & Gromit’s crazy comic strip capers will bring you madcap inventions, amazing adventures and a whole host of new loveable characters! Us US fans can’t order it directly from the site, but I’ll take a look around the web to see if we have other options. Excited yet? Read more in an interview with the comic’s editor, Steve White: downthetubes.net interview with Steve White. Thanks to John Freeman of downthetubes.net for letting me know about the release of this comic! This entry was posted on Saturday, September 3rd, 2005 at 9:27 am	and is filed under News. You can follow any responses to this entry through the RSS 2.0 feed. Both comments and pings are currently closed.